S. Afr. J. Bot. 63 (1997) 382-89. 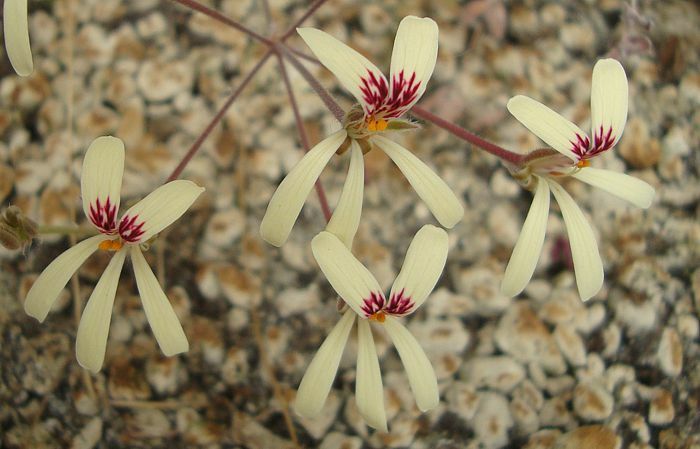 Deciduous geophyte 60-140 mm tall when in flower, tuber turnip-shaped or elongated. Radical, regularly pinnatisect; lamina elliptic in outline, 50-80 mm long, pinnae 15-20 x 8-18 mm, irregularly pinnatilobed to pinnatisect, segments 3 mm wide, apices obtuse, margins entire, adaxially and abaxially densely hirsute with appressed stiff hairs, petiole 20-40 mm long, erecto-patent, densely hirsute with appressed hairs. Stipules subulate, adnate to petioles with apices free. Scape, bearing 2-4(-9) pseudo-umbellets, each 3-8-flowered. Pedicel cca. 0.5 mm. 5, lanceolate, apices acute, 5-9 x 1.5-3.5 mm, posterior one erect, others patent, green to reddish brown, margins white. 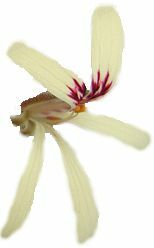 Hypanthium 20-34 mm, 3-6 times as long as the sepals, green to greenish brown. 5, yellow, claws forming a sheath, apices patent during anthesis; posterior two with wine-red feather-like markings, spathulate, 13-23 x 3-6 mm, length/width ratio 3.2-5, apices rounded, truncate or emarginate. Anterior three spathulate, 12-20 x 2.5-5 mm, bases attenuate, apices rounded. 5 fertile, posterior one 1.5-2.5 mm, lateral two 3.5-4.5 mm, anterior two 5-7 mm long, slightly shorter than the sepals. 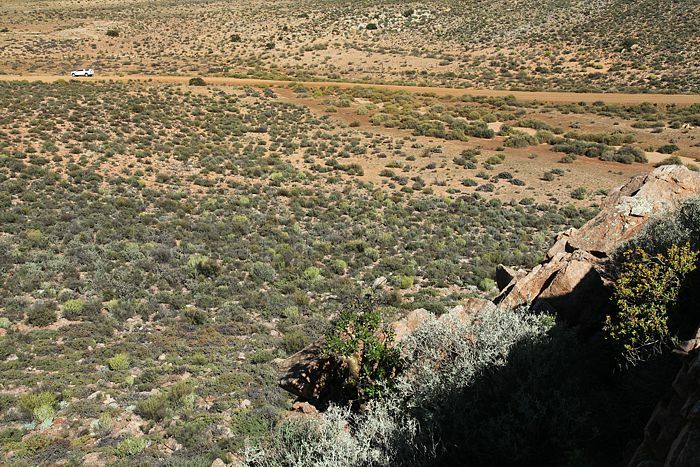 P. aridicola is found in arid or semi-desert environments, such as the hills around Concordia in the Northern Cape Province. 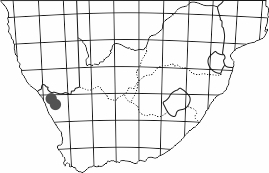 These hills represent the north-eastern boundary of distribution of the section - the landscape further east is just too dry and slowly transitions from winter to summer rainfall. 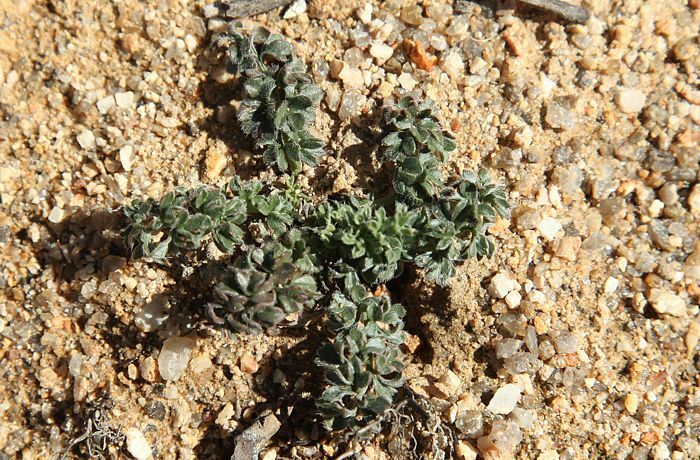 Xerophytic pelargoniums found further east, such as P. spinosum or P. xerophyton, opportunistically grow whenever there's a sign of rain.